Bayfield Lions Club members, from left, Sandy Robison, Ray Lawrence, Lynn Tollar and Shirley Bailey serve chili at the clubs free chili lunch Saturday afternoon. The lunch was a thank-you to the community for helping the club raise money to buy Lions Hall, which will remain a gathering place for civic groups, parties and fundraisers. When the Bayfield Lions Club announced, during the worst economy in recent memory, that it was launching a fundraising campaign to buy the hall it had rented for decades, a lot of people, me included, wondered if they could pull it off. This is an occasion when I am happy to be proved wrong. The Bayfield Lions Foundation, formed to create a 501(c)3 nonprofit that would make peoples contributions tax-deductible, closed on the hall in late 2012, after raising about $135,000, almost $65,000 of that from Bayfields 2,300 residents and businesses. Three men started the campaign, Ken Gaherty, Mike Clark and Ron Dunavant, after the Colorado Grange, which owned the hall, where the club has met for decades, announced it was going to sell the building. The Grange gave the Lions first right of purchase if members could raise the money by the end of 2012. They did, and the hall will continue to be a community gathering place for decades to come. About 200 people made $100 donations, Gaherty said, several businesses chipped in, and grant writer Kristin Hartzell applied for and won all four grants they identified as being possibilities. The club also held several fundraising dinners, and the town turned out in force to support its efforts. On Saturday, the club served a free chili dinner to thank the Bayfield community, with about 100 people attending. 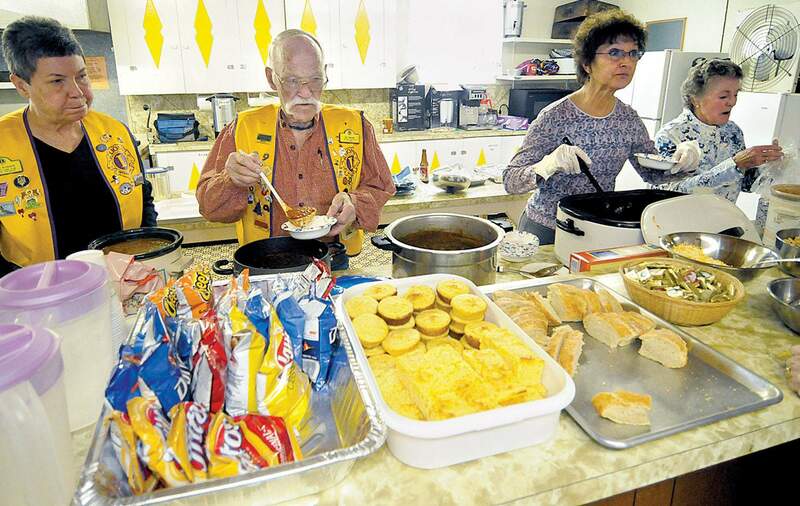 Except for one member who was recuperating from back surgery, the entire club made a pot of red, baked cornbread or cookies and showed up to feed their friends and neighbors. This hall isnt just where the Lions themselves meet, they provide a gathering place for 4-H clubs, Girl Scouts and the American Legion as well as other civic-minded groups. And when a member of the Bayfield community experiences a tragedy or medical crisis, the Lions Hall is where the town generally comes together to raise money, with the Lions contributing not just the hall, but often some much needed funds as well. In fact, during the last three years, the Lions Club has donated more than $20,000 to good causes, about 87 percent of which stayed in the Bayfield community. Buying the building was the first step of what will probably be another three-year project to raise the funds to make much-needed repairs. The banquet the club created as a fundraiser for the capital campaign will continue to help raise that money, and Gaherty tells me the 2013 event will be held April 6. Another goal is to build an outside pavilion, perhaps with a fire pit, for the party-rental crowd, and to make the clubs annual Pancake Breakfast a little easier on members. They serve about 800 people every Fourth of July. Many congrats go out to the Bayfield Lions Club. Getting their geek on for their birthdays are Dona Anderson, Barbara King, Jim Bolen, Sally Bradley, Carol Martin, Scott McCool, Mike Sarti, Jacquie Caldwell, Aurora Rose, Pauline Murphy, Carol Wallace, Elijah Spaeder, Randy Paskas, Luis Marquez, Don Anderson, Denise Krispin, Regina Roark, Charlie Wilmoth and Holly Englund. These days, more and more people are surviving breast cancer  good news that comes from a concerted effort and years of raising money to fund research. One local survivor is Cathy Cat McClure, and she has taken her creative juices and applied them to designing and making one-of-a-kind bras. She calls them Mardi Bras, which is a great trademark and reflects the Carnival flavor of some of her lingerie. At 2 p.m. Saturday at the American Legion, as a fundraiser for the American Cancer Society, local beauties will be modeling some of McClures creations, which will then be auctioned off. Or perhaps I should say some local beauties and Ralph Dinosaur, whose appreciation for the ladies lingerie item has become a standard part of his act. Hes apparently on tap to model the bra in the grand finale. Tickets are $20 in advance and $25 at the door, and they are available at 360durango.com or by calling McClure at 799-0251. The American Legion is located at 878 East Second Ave.
One of the highlights in January is always Trails 2000s dinner and auction. In its 24th year, it was held Jan. 23 at Old Tymers Café, which has got this fundraiser down to a science thanks to longtime staff member liaison Corel Miller and new general manager Mike Shepherd. Guests arrived to appetizers of calamari with lemongrass aioli, whipped brie de beaux and California and spicy tuna rolls by East by Southwest before sitting down to Sunnyside Meats ribs prepared by chef Tony Blankenship with a hoisin glaze served with an Asian slaw and coconut rice pudding. Bread donated potato-sage rolls. And then dessert, a scrumptious plate of truffles from Rocky Mountain Chocolate Factory alongside a crème brûlée kiss especially made for Trails 2000 by the folks at Bread. More than 300 silent auction items from individuals and businesses were donated, and organizers created 45 live-auction packages from the bounty. Calvin Story once again came out on a cold winter night to keep the bidding spirited. One special item was a bike ride on the Animas River Trail led by Olympian Travis Brown and Parks, Open Space and Trails Manager Kevin Hall, with lunch at Shawn and Tamra Candelarias home catered by Zia Taqueria. Lucky purchasers Melissa Youssef and Julie Levy are going to be getting calls from all their friends hoping for an invitation to that one. The auction committee, led by Shanan Orndorff and made up of Katri Annast, Laura Bohachevsky, Moira Compton, Connie Gordon, Pam Glasco, Connie Wian and Tracy Wilde, is taking a deep breath and celebrating raising more than $40,000 for a cause that affects the lives of everyone who enjoys the great outdoors here. Trails 2000s volunteers donate more than 3,500 hours a year to build and maintains our trail network. To learn more, and to sign up for the e-list and upcoming trail work days, visit www.Trails2000.org. This group not only has an inordinate amount of fun at its parties, members greatly enjoy working together out on the trail, too. My thanks to correspondent and Trails 2000 Executive Director Mary Monroe, who is one of the best ever at noticing the details I like to include in an item. Pulling out their pocket protectors and 1980s fashion statements for their Snowdown anniversaries are Howard and Karen Preston and Hans and Lanette Hartman.